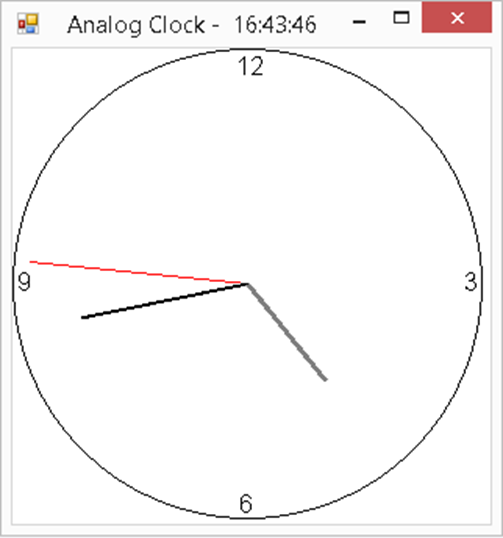 In this tutorial we are going to use a bit of graphics class to design a C# analog clock. We have also used a timer to continuously move our clock’s pointer. We will first initialize some angle values to second, minute, hour hand. Then draw the clock using the graphics class, save it as a bitmap variable and load it in the picturebox. Finally Use the timer to move the second hand. Create a new windows form applicaton project in visual c#. Add a picture box on the form. Double click the form to switch to code view. Delete all the existing code and paste the code given below. It directed me to the Form1.Designer,cs, how can i go about this? What is hlen and why we not use main () function? Thanks for a straightforward example. My clock gadget stopped working, so this is a great substitute after I made some tweaks to change the size. Note to the others with questions, main() gets created for you when you create a C# forms project. You need to add a load event to for Form1_Load to be called. Then add the code here into form1.cs. What is mean ( COORD ) ? Pls give us less details so we can appreciate your substiantiated comment even more.. There is no out put plz help as..